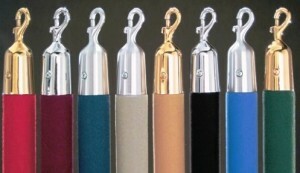 Stanchion ropes come in a variety of colors and are constructed from many different materials. 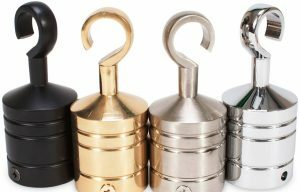 You can choose between economy priced stanchion ropes, heavy duty and premium ropes. Depending on the type of rope you need, we have warehouses in New York and Los Angeles and can process your order and ship quickly. 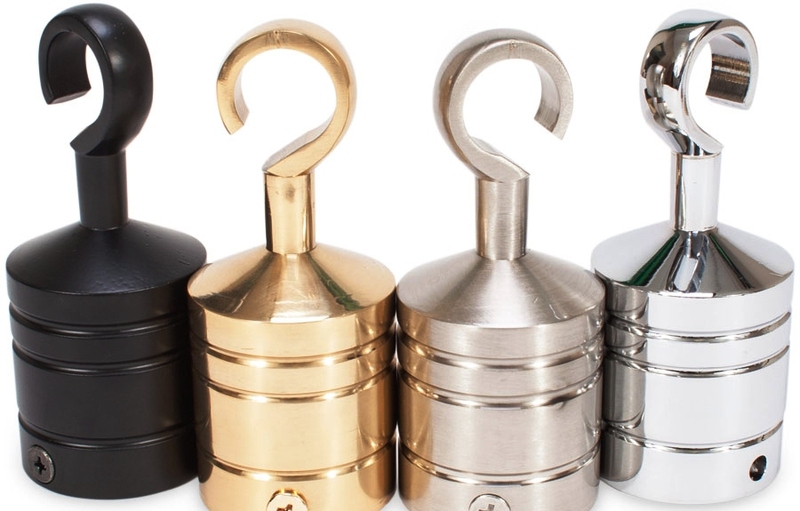 Select the stanchion rope type you need from the tabs just below to see choices. Contact us for a quote and availability. 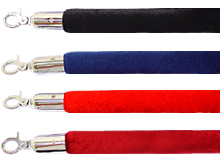 The most affordable stanchion ropes you can purchase are foam filled velour ropes. These value priced ropes are ideal for many settings and uses including use by party rental companies. PRICE: Prices start at $24.95 each plus shipping. Ropes are measured from end piece to end piece. 1.5″ diameter cotton core velour ropes are heavy duty stanchion ropes. PRICE: Prices start at $39.95 each plus shipping. Ropes are measured from end piece to end piece. 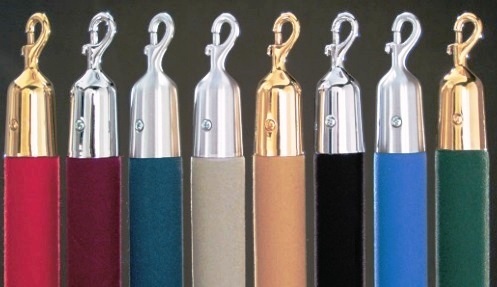 1.5″ cotton core Nyvel stanchion ropes are 100% nylon with a velour finish. These durable, soil resistant ropes are primarily for indoor use. PRICE: Prices start at $39.95 each plus shipping for a 2′ rope including ends up to $99.95 each for 8′ ropes. Ropes are measured from end piece to end piece. 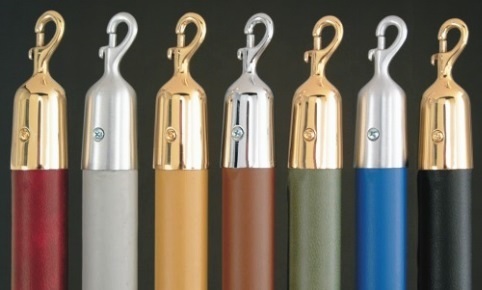 Naugahyde stanchion ropes add a touch of class to the environment. First, what is Naugahyde? Naugahyde is artificial leather. These are 1.5″ Diameter cotton core fabric ropes coated with rubber or vinyl resin. These ropes can be used outdoors on a limited basis. 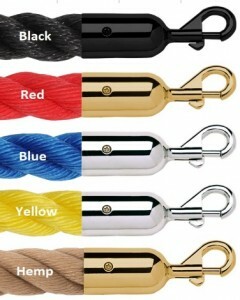 PRICE: Prices start at $39.95 each plus shipping for a 2′ rope including ends. Ropes are measured from end piece to end piece. Recycled leather stanchion ropes are another classy looking rope you can use to set the tone in your establishment. These are 1.5″ Diameter cotton core fabric ropes coated with rubber or vinyl resin. These ropes can be used outdoors on a limited basis. There are a few choices with braided stanchions ropes. Some are fixed length from the factory so choose wisely. Braided polypropylene are your best choice for outdoor use*. PRICE: Prices start at $39.95 each plus shipping for a 4′ rope including ends. Ropes are measured from end piece to end piece. These are thinner diameter 1 inch braided stanchions ropes that can be used outdoors. These are thinner diameter 1 inch braided Nylon stanchions ropes. USE: Indoor or Limited Outdoor. 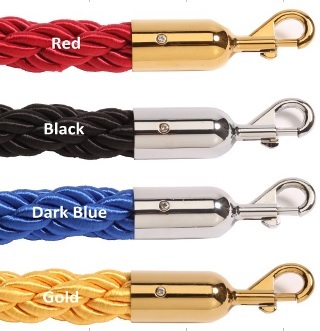 PRICE: Prices start at $29.95 each plus shipping for a 4′ rope including ends. Ropes are measured from end piece to end piece. 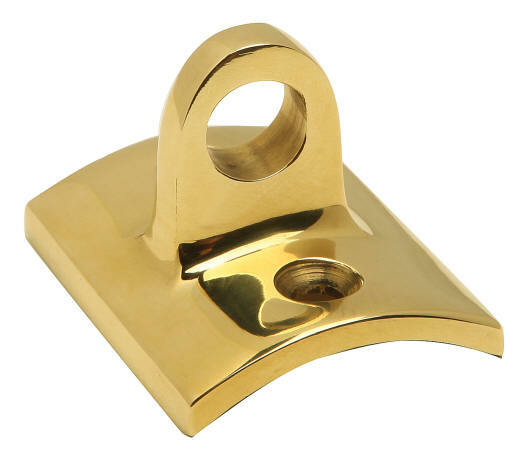 Colors include popular polished brass/gold, polished chrome aka polished stainless or silver, matte or gloss black, satin brass, satin chrome, and specialty colors like bronze and powder coated colors. Rope end color choice usually is ordered to match the stanchion color. We recommend using the ropes from the same manufacturer as your stanchions. This way the rope end color will most likely match your stanchion. Colors vary between manufacturers and suppliers. If you plan on attaching your stanchion ropes to the wall, you will most likely need wall plates. QUANTITY: How many stanchion ropes will you need? LENGTHS: We need the length of each rope. Please measure rope end to rope end. When ordering cotton core ropes, it is not recommended to exceed 6′ when using with post and rope stanchions. The economy foam filled ropes should not exceed 8′ from stanchion to stanchion. 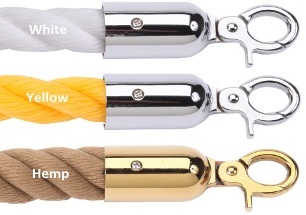 COLOR CHOICE: We offer ropes from multiple suppliers. 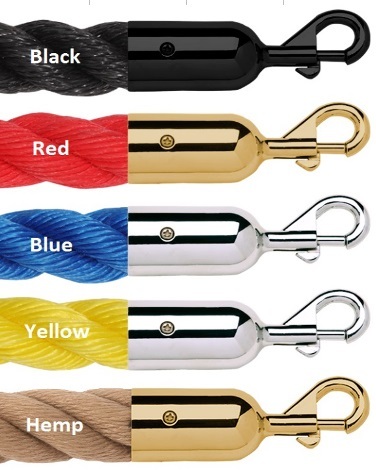 Please state the color and type of rope you want and list the supplier if listed. 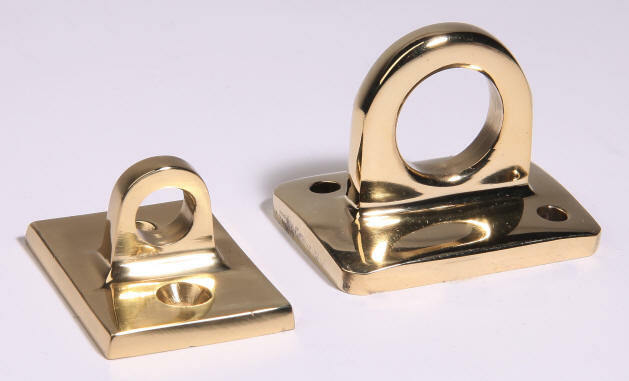 ROPE END CHOICE: The color of the rope end should match your stanchion rope ring color. Specialty finishes are extra and take longer to process. 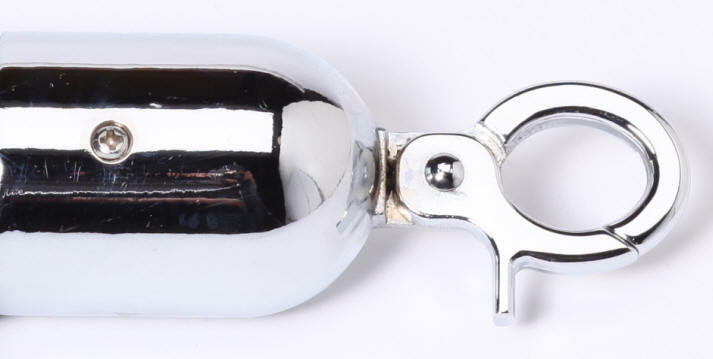 We also need to know open hook or closed snap end. ROPE USE LOCATION: Will your stanchion ropes be used indoors or outdoors? Some ropes will not last when exposed to direct sunlight, rain or salty air. We will recommend the proper ropes based on the location you wish to use them. Some ropes can also be treated for outdoor use.